a little uphill in the village of Chora Sfakion, Southwest coast of Crete. 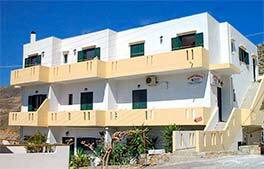 Four apartments consist of 2 rooms: 1 bedroom and 1 living room with kitchenette, suited for 1 to 4 people. We offer you very affordable rates for your stay with us, short term and long term. 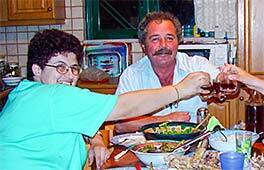 Sofia and Aristotelis Perrakis, your hosts, have a long experience in welcoming guests. In the village of Chora Sfakion you can find a bakery, butcher, 2 mini markets, several restaurants and tavernas, local bus connections, and ferries to the villages to the west. There is a post office, an ATM/ money cash machine (VISA, MasterCard, American Express, and Maestro-enabled regular bank cards from your own country), a public telephone and a first aid centre with a doctor. Several beaches are close by. It is just about 500 metres walking from Four Seasons until you are on the village beach. By car it is 2 minutes. 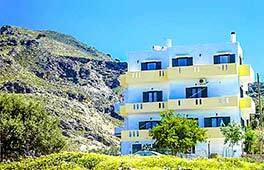 We can also take care of arranging a taxi transfer for you directly from the airport or harbour of your arrival on Crete, or deliver a hire car there, or at the apartments. You can pay in cash Euro when you are in your apartment. A deposit is not required. 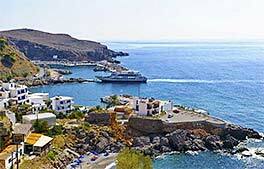 Click the photos below to find all information you need to make the most out of your holidays to Sfakia and Crete. How to find us by car, bus, taxi, ferry or on foot. 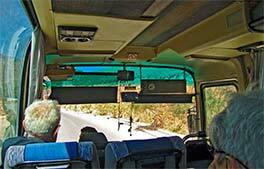 Practical info for visitors to Sfakia and Crete. Everything about Sfakia history, culture, activities, customs, maps. Live beach webcam from Vrisi Beach in Chora Sfakion. Copyright © Four-seasons-sfakia-crete.com 2002 - 2019. All rights reserved.